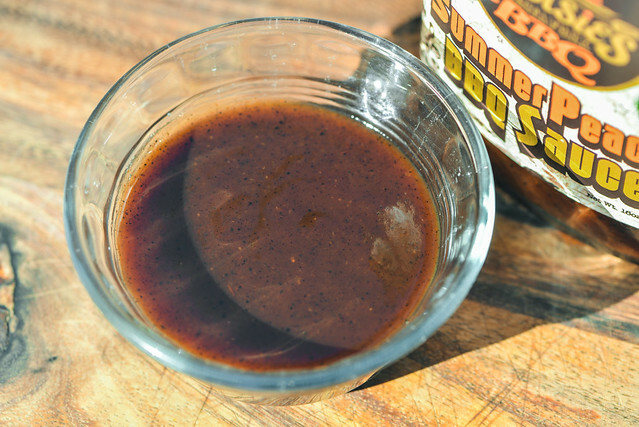 Summer Peach is a sweet barbecue sauce with a lot of character, from the double dose of fruitiness to the well balanced tang and earthy and spicy chilis. The origins of Bootsie's Delta Funk BBQ sauces can be traced back about 100 years to Tunica, MS. This is where the family of current co-founder, Adrian Boyd, began developing their barbecue recipes which were passed down through the generations. 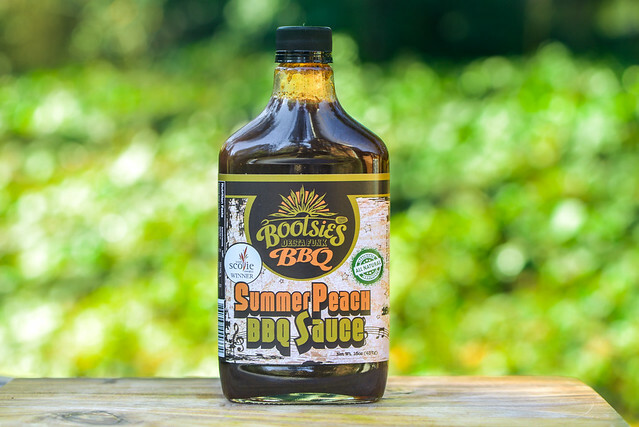 It wasn't until recently though that the family began bottling and selling their sauce, which happened when Adrian teamed up with Peter Grumbles and Anish Elam to bring the Bootsie's brand to life. The recipes aren't purely traditional though, Adrian has toyed with the sauces and also brought in Indian influences, which he attributes to to his wife, Latha. Bootsie's currently has four different sauces and three rubs and manufactures out of Pope, MS. 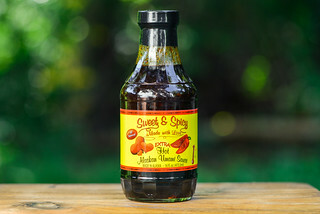 This sauce has a very mild and understated aroma whose initial smell is only a very mellow vinegar and sugar mixture. It takes some deeper whiffs to start to uncover the other ingredients at play here. Sitting behind the sugar is a fruity character that does have hints of sweet ketchup and peach. There's also a mild peppery heat that pops out from behind the mainly sweet profile. This maroon sauce has a smooth texture and glossy sheen. While it has a dark hue, it's still semi-opaque, which makes it easy to see a ton a spices that come in small and medium specs that are red, black, orange, and white. The sauce's thickness is medium thin and lightly syrupy, and this has it falling off of a suspended spoon in a very fast and bit uneven pour. It only takes a few seconds for the sauce to slow to drips that release quickly before ending with one or two final drips and then ceasing, leaving a thin coating of sauce on the silverware. Staying in tune with the aroma, the first taste of this sauce is somewhat flavorless. This nondescript taste only lasts a couple seconds though before a sugary sweetness with a background molasses comes in. 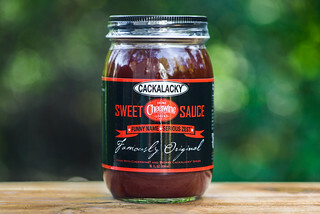 As the sauce settles on the tongue, the sugar gains character from an equal combo of tomato and peach before the vinegar works its way in and adds balance to the fruity sweetness. 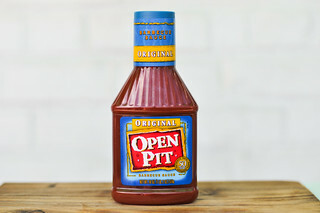 Next, an earthy chili combo further enhances the barbecue flavor while the vinegar continues to turn up the tang. The chilis then release some heat to create a lightly spicy, tart, and fruity aftertaste. The sauce coated the chicken in a thin, even layer that took a few brushings before it gained a dark maroon color. It baked down well over indirect heat, then caramelized quickly over direct heat with only minimal sauce loss. The flavor was much more robust after cooking. It may have been thanks to the multiple layers of sauce, but the leg had a very pronounce bright and fruity taste that retained its vinegar tartness and earthy heat from out of the jar. 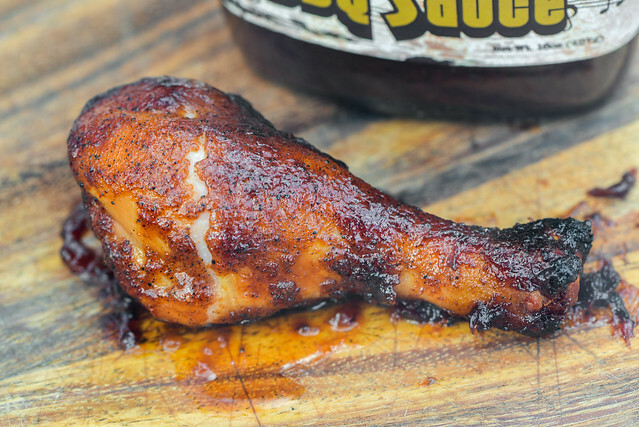 This made for a well seasoned and multi-faceted piece of barbecue chicken. The good folks at Bootsie's Delta Funk BBQ sent me their entire suite of sauces for reviewing, and now that I'm three deep into the line-up, I can say they have a trend of impressive offerings. Summer Peach didn't quite hit the same high notes that their spicy and white sauces did for me, but it continued to show they're well versed at creating balanced, layered, and unique sauces. I would consider Summer Peach their recipe for those with a sweet tooth, but it definitely doesn't just amp up the sugar and stop there—you get a nice fresh fruity flavor delivery in the sweetness, as well as a good balance of vinegar and chilis to keep things interesting. I thought the sauce picked up a bit more flavor after being cooked, so that was my preferred way to use it. Both out of the jar and cooked though, it isn't the most powerful of barbecue sauces, so I think it's best paired with light meats and veggies—think pork, chicken, seafood, etc.